My sister sent me a surprise gift the other day that was so sweet. She has a kind, generous heart. So, the other night when I didn’t feel like sleeping, I grabbed a sketchbook and a Prismacolor pencil (whatever’s closest, lazy artist) and had a quick go. I kinda like the way it turned out. I usually prefer to sketch living things, but he’s got some life in his eyes, for sure. It was a fun wind-down before bed. Happy Saturday, and Happy Labor Day weekend to my friends in the States. Peace. Adorable and what a sweet gift from your sis! I’ll say it was! 🙂 Is there a special connection around moose? Hope you are doing well Sweetie! Sisters know just how to make life a little better, happy sketch! Sounds like your sister doesn’t live close by either…I miss mine, too. 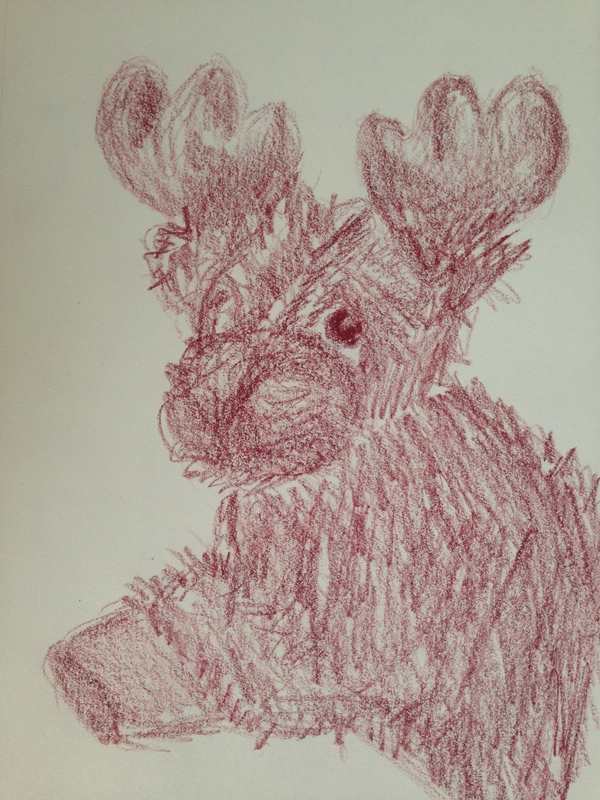 Darling moose, and your rendition really captures its fuzziness and sweetness! Awww…this is super cute Laura!! Wonderful sketch…even your sketch looks cuddly! Haha!! That is a really cute sketch! The moose looks absolutely adorable! Nice sketch and good practice. I have a collection of toy animals! So cute. Have a great weekend too. Thank you, Julie. Have a wonderful time! Our family has a running joke about me never seeing a moose! So I smile at the site of any moose!! So cute :-). He reminds of “Moose in a Can”. I wonder what happened to him? I like how soft and long-limbed he is. Kind of like Truffles, one of the two teddy bears I decided would survive into my adulthood. I, um, sleep with him sometimes when my partner is away. Thank you, and what a cool visual you’ve just conjured up! :)) have you ever tried drawing your bear? Not yet. The texture seems daunting. 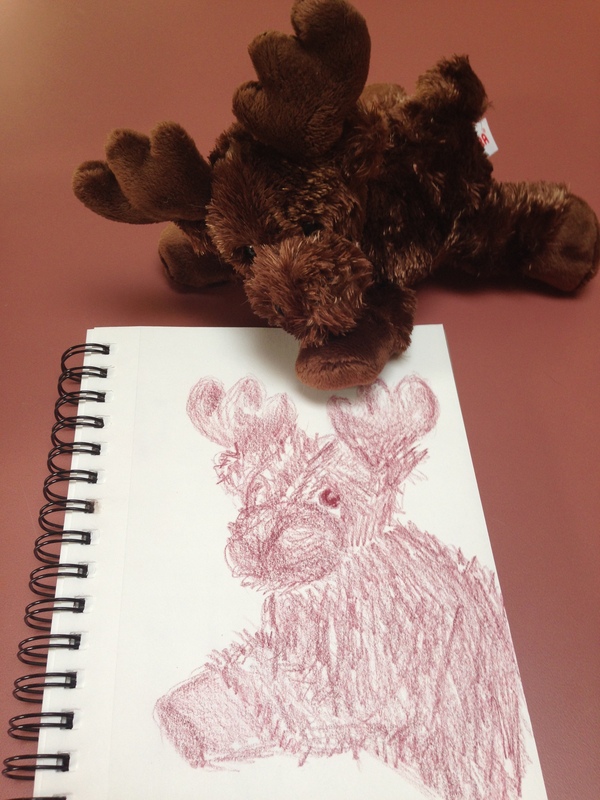 But the color pencil you used for your moose would be just the right color! Maybe I’ll play around with the shade of brown I have and see what happens. Maybe I’ll have a little living room dance-off first and try to channel your loose moose :-). It’s so fluffy~ ❤ Nice work! So sweet and thoughtful of your sister. Your sketch brings it to life and captures it snuggly cuteness. Delightful. Peace. Laura this is so sweet. Awww, this is so cute!!! Great job, Laura!!! 💕 Art helps in so many ways, sometimes even through the night. I´m constantly amazed by the calming power it has. Me too! It’s like a miracle at times. Particularly when I’ve done something I’m pleased with. Thank you, I’m glad you like my little moose.